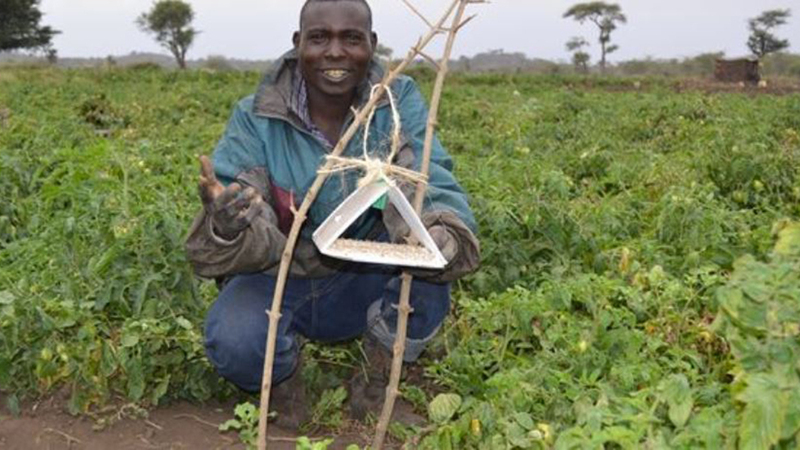 A farmer sets a pheromone trap to fight tomato leaf miner. Photo by CABI. The Centre for Agriculture and Bioscience International (CABI) has led an international team of non-native species (NNS) specialists who have compiled a list of recommendations to improve the way in which the impact of a range of invasive pests – such as the tomato leaf miner Tuta absoluta – are assessed, potentially helping towards ensuring greater global food security. The global cost of the world’s 1.2 million invasive species is estimated at $1.4 trillion per year – close to 5 percent of global gross domestic product. In East Africa, five major invasive species alone cause $1 billion in economic losses to smallholder farmers each year. “There is an increasing demand for robust and user-friendly impact assessment protocols to be used by professionals with different levels of expertise and knowledge. Robust NNS impact protocols should ideally result in accurate and consistent impact scores for a species even if applied by different assessors, as long as they have the adequate expertise in the assessed species and context. Text originally published by CABI.